An exterior view of NASA Johnson Space Center's Shuttle Motion Simulator (SMS), which will be moved to Texas A&M University in 2012. NASA's long-running space shuttle program came to its end in 2011, but thanks to a recently signed agreement between the space agency and a Texas university, one of the winged spacecraft's iconic cockpits will continue to "fly." The Shuttle Motion Simulator (SMS), which for more than three decades exposed astronauts to the sights, sounds, and motions they'd experience when they launched and landed on the real orbiters, is being moved 100 miles from NASA's Johnson Space Center in Houston to Texas A&M University in College Station. Once there, the hydraulically maneuvered platform will resume work as a simulator. "The SMS at College Station at Texas A&M is going to be returned to be an operational simulator," Paul Hill, director of mission operations at NASA Johnson, said. "And there, more students and engineers will have the opportunity not just to see it, but actually use it to develop new operations and develop new equipment to be used by next-generation spacecraft. Hill and Texas A&M president Dr. R. Bowen Loftin joined other NASA and university representatives at Johnson on Dec. 19 to sign the Space Act Agreement that transferred ownership of the simulator to the educational institution. The simulator will be moved in two shipments, the first in January and the second in June 2012. The highly-detailed flight deck, its six hydraulic legs and the many computers that control their motion will be reassembled inside Texas A&M's University Services Building, adjacent to its Space Engineering Research Center, located about a mile off the main campus. "When the SMS does get to College Station and we install it, we're going to preserve it as a piece of living history," said John Valasek, director of the vehicle systems and control laboratory in Texas A&M's aerospace engineering department. "It is not going to be changed or modified in any significant way. The crew of STS-135, the last crew to fly it, will be able to come into the simulator and see it exactly as it was when they were last in the simulator for training." "It will be living history that many people can enjoy," said Valasek. And by many, he didn't mean just engineering students. "So access to space will have a whole new meaning now because a lot of the public will be able to really enjoy and partake in at least a small part of this for the very first time. It will definitely be widely accessible to all of the public to come in and enjoy for many years to come," said Valasek. "There have been 135 missions, 355 astronauts and now, it's your turn," he said. The shuttle motion simulator first began flying missions at Johnson Space Center in 1977, so in a sense, it has been flying longer than any of the shuttles that launched into space. "The SMS's work officially started about 34 years ago and that's a couple of generations of people who have known, lived and worked with that piece of equipment," said Mike Fossum, a two-time shuttle astronaut, International Space Station commander, and graduate of Texas A&M. "It is a cantankerous thing. It takes a lot of care and feeding, the hydraulics systems and electronics, to keep it going." To help address this, NASA is providing Texas A&M with documentation and a full set of spare parts to keep the simulator running. Perhaps of even more value, some of the people who operated the SMS at NASA will be lending their expertise to Texas A&M. "Some of the personnel who worked on it during their entire careers will also be coming up to help us with the reassembly, and then possibly too, for some of the long term work of running it and instructing people," Valasek said. 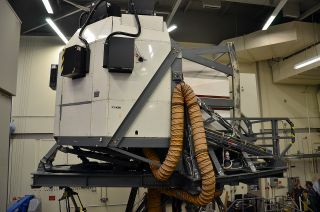 Even then, the simulator will start at the university on a fixed base. Full motion will be restored later. How long it stays horizontal may depend on just how cantankerous it is after its move. "It is a difficult thing to predict but it will be matter of a few short years," Valasek said. Even without being able to tilt, rock and roll, the SMS will give students and, on at least several days a month, the public the rare chance to be a shuttle commander or pilot and fly a re-entry through landing. "I really like the fact that we are not going to put a plaque on it and let it gather dust," said Fossum. "This is a living item we're going to continue to use. Its mission is not yet complete." Continue to collectSPACE.com to see more images and video of the Shuttle Motion Simulator (SMS) in motion.